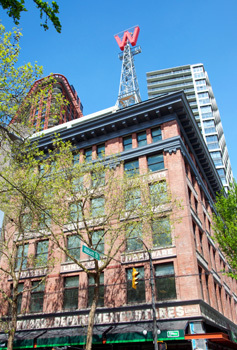 The historic Woodward's building, located in the 100 block of West Hastings Street in downtown Vancouver has undergone a major redevelopment. The site now combines market and non-market housing, along with commercial and retail space and institutional art spread over several buildings. The project has socially, environmentally and economically sustainable principles at its core and is a critical part of a larger effort to revitalize this historic Vancouver neighbourhood. Among the project highlights are 200 non-market housing units, a daycare facility, non-profit and federal office space, and a sustainable environment with green spaces on rooftops. In addition, a 40 story market and non-market residential tower, retail and office space, and city non-profit space in the original 1903 Heritage Building round out the expansive city-block project. The indoor Atrium and garden areas allow flow-through pedestrian access to encourage and draw in people from surrounding neighbourhoods to participate in the social and economic revitalization of the area. Sustainable building concepts are utilized throughout. The centralized steam generation plant, local and recycled material sourcing, heat scavenging and optimized air-cooled fluid coolers are among many of the site's energy efficiency features. The site's size and multi-building nature required unique solutions for the control network strategy. While portions of the system are meant to function independently, there is inter-dependence throughout common areas of the site, such as the parkade, mechanical and electrical rooms and equipment. Communication between separate yet inter-dependent systems had to be transparent and continuous. In addition, the sheer amount of control devices and equipment related to the entire site had to be intuitively organized and visually connected in the graphical user interface in order to allow building operators to properly determine all equipment functions and their related operating spaces. Our control strategy provided a common LonWorks® based backbone for the site, which could branch out and expand into each of the 4 distinct buildings. Ethernet-based connectivity was established between controllers and the supervisor device and all building information was pooled into the all-encompassing graphical user interface. Intuitive navigation and detailed floor plans allow access to all parts of the building, clearly identifying and providing monitoring and adjustment control to all relevant equipment, based on proximity in the corresponding building. The unified interface provides real time access and system alarms as well as complete trending features at all times through Internet connectivity. The Woodward's Redevelopment Project brought together multiple partners to build a new vision for the historic Vancouver site. Similarly, the site combines a multitude of equipment controls, varied spaces and unique control requirements. Modern Systems Management brought together all design goals and operating specifications into a seamless, integrated control solution which provides full remote access, timely system alarms, easy-to-use interface for adjusting space settings and effective trend logging for data analysis and troubleshooting. We have provided the flexibility needed to grow and change the building system as the needs of the multi-faceted facility change, providing longevity and a protected investment. Modern Systems Management Ltd. is a leading provider of HVAC control, building automation and direct digital control (DDC) solutions. Based in Surrey, BC and with offices in Victoria, Modern Systems Management Ltd serves British Columbia and Yukon, including Greater Vancouver, Vancouver Island, the Gulf Islands, northern regions and the Interior. Since incorporating in 1978 as an independent field office of Barber Colman for British Columbia, Modern Systems Management Ltd. has acquired an extensive building base of installed equipment through our professionalism and expertise. We provide top quality solutions for heating, ventilating and air conditioning (HVAC) temperature controls systems in commercial buildings, as well as many other building automation products including lighting and monitoring systems.